Rotor 10 pcs. 12 pcs. Rotor 14 pcs. 14 pcs. LION power harrows guarantee extremely smooth running and high strength. These machines operate reliably even in the hardest conditions and heaviest soil. Thick-walled gear trough made of fine-grained steel – extremely resistant to twisting. Tapered front edge – soil can flow past unrestricted without bulldozing. Large gears feature integrated bearings. Extended inner splines for a secure seat on the rotor shaft. The bearing housings are welded to the central gusset and bottom of trough. An exact spacing between each rotor is guaranteed as a result. Robust tapered roller bearings in forged, single-piece bearing housings. The lower bearings are located as close as possible to the tine carrier, helping to reduce lateral stress. The upper and lower bearings are spaced as far apart as possible to reduce load and minimise stress. The forged, full-width tine carriers are integrated into casing. This offers the best protection against wrapping because the tines deflect the soil away from the gear trough. As a result stones cannot become trapped between the rotors. Bearings and gears run submerged in semi-liquid grease. The tines are 0.71" / 18 mm thick and can be reversed to be used on both edges. Quick-fix tine replacement system optional. The high-strength deep gear trough provides the gearbox with excellent torsional strength. The deep gear trough is formed from a single piece of steel. The welded central gusset provides maximum stability. The bearing housings are welded into the box section before milling at the CNC machining centre. This ensures exact rotor-to-rotor spacing and guarantees you smooth-running and a long service life. Forged components from the PÖTTINGER hardening centre offer many years of reliability. The bearings and gears are sealed and run submerged in semi-liquid grease. The tough bevel gears are made from tempered steel. The lower bearing is located close to the tine carrier. This takes the stress off the bearing and reduces wear. The shaft and bearing are protected by a labyrinth seal, which prevents loss of semi-liquid grease and at the same time ensures no dirt can penetrate. The tines are the critical interface to the seedbed. Penetration of the ground is optimised for the most uniform tilth. LION power harrow tines are swept inwards and angled to the rear. As a result the soil near the surface is loosened and crumbled intensively. Larger clods remain lower down. The shape of the tine is designed for standard drilling, mulch drilling and direct mulch drilling.. The 18 x 340 mm thick tines are made from hardened boron steel and are heat treated right through the complete cross section. The LION 303.12 features tines with dimensions of 15 x 330 mm. Both tines are seated securely in the recesses in the tine carrier. Two alignment pins keep the tines centered and they are secured using a clamping plate. Only two bolts are needed on each rotor. These can be loosened without chocking the rotors. Refit lock and lynch pin – finished! The tines can be positioned aggressively pointing forwards, or in a trailing position. Either position achieves excellent tilth at seed placement level. Finer soil is concentrated at the level of the seed. Larger clods and harvest residues remain on the surface to protect against erosion. Angled forwards the tine breaks up the soil from underneath for mulch drilling, mixing harvest trash well into the soil. Only possible with the 0.71" / 18 mm thick tines. The linkage is widely supported. Double-sided Category 2 and 3 free swinging lower linkage and three position adjustment are designed to bring the power harrow as close as possible to the tractor. On the LION 403 and 4002 the headstock is fitted with additional side struts. Select the desired rotor speed by changing gear combinations. PTO shaft is only at a minimal angle with the input shaft placed well back. As a result smooth, quiet operation in the field and at headlands. Cam clutch protection ensures trouble free operation and gearbox cooling fins regulate gearbox oil temperature. A rear PTO shaft is available as an option. The height of the side boards is adjusted using slotted holes. These can be simply folded upwards during transport. A parallel linkage optional. Unique system: The spring does not need to be disengaged to fold up side boards. The rear levelling board is standard and is set automatically with the depth of the rear roller – no readjustment is necessary. Consistent distance from the tines over the full working depth range thanks to linear guides on frame. Initial depth set using pin-in-hole adjustment. This is easily accessible from the side. The front levelling board (optional) is identical to the rear board. Conveniently the scrapers can be adjusted from a central point as well as individually. A POTTINGER seed drill can be mounted directly to the rear roller and top link. The result is the seed drill and roller work as one follow ground contour changes exactly. Closely mounted to the roller scraper bar keeps overall length to a minimum. Coated hard wearing scrapers are standard on 19.68" / 500 and 21.65" / 550 mm tooth-packer roller, crumbling-packer roller, pack ring roller and rubber packer roller. 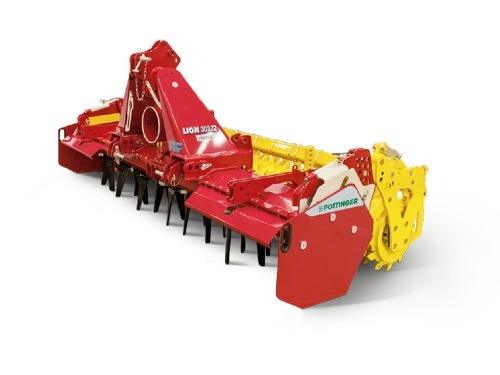 Spring-mounted track eradicators are on all LION power harrows. These are spring-mounted to protect against stones and foreign objects. The working depth can be adjusted without using any tools. Reducing costs is top priority in arable farming. Save money with a power harrow/seed drill combination. Hydraulic mounting system for independent seed drills with eight and length adjustable linkage. Two hydraulic cylinders guarantee maximum lifting power up to 52.91 sht / 2.4 t for larger mounted seed drills. Implement mounted with a mechanical top link. VITASEM and AEROSEM seed drills from PÖTTINGER can easily be mounted. The centre of gravity is in front of the rear roller – very close to the tractor. The additional weight of the seed drill on the roller provides even better consolidating effect for the seedbed. The gap between the coulter rail and the rear roller is minimised to form a compact unit. The piggy-back drill is mounted on the packer roller and guided by the top link using a parallelogram so the packer and seed drill form a single unit. This enables the working depth of the power harrow to be changed by adjusting the roller without having to correct the seed drill top link. Improved of centre of gravity in relation to tractor. High ground clearance of drill coulters at headlands. The ideal roller for dealing with dry, non-sticky soils. The roller is fitted with strong rods for optimal compression. This roller is suitable for all types of soil. The roller leaves behind an optimum, re-packed seedbed with loose, fine soil at seed level. The scrapers are located just above surface level. That is why no earth clods can be lifted away, even in wet conditions, and a perfect capillary structure remains intact for optimum germination. The scrapers can be adjusted centrally and individually. They can simply be pivoted away for cleaning. The hardened scraper plates are reversible for double the service life. Roller diameter: 16.5", 19.7" and 21.7" / 420, 500 and 550 mm. The teeth are hardened right through. Case-hardened scrapers are also available. The teeth are offset at an angle to the left and right. This roller is especially suitable for heavy, clay soils. The result is a deep packing effect with loose crumbling effect just under the surface. Coated scrapers (standard) prevent soil sticking to the roller. The packer rings are fully enclosed and have a diameter of 21.7" / 550 mm with 8 rings per metre of working width. Due to the small hub diameter, the scrapers do not need to contact the roller or be adjusted. The roller produces a corrugated consolidation effect to promote water absorption and allow the soil to breathe. Ideal for stony, damp conditions and heavy organic residues. Harvest residues remain on the surface of the soil and protect the soil against drying out. Case-hardened scrapers are standard. The Prism rings are spaced at 12.5 mm or 5.9 inch. This roller handles all operating conditions, including stony ground and larger quantities of harvest trash. The striped formation of re-consolidation promotes water absorption and breathability of the soil that is subject to less compaction in the gap between the rings. Coated scrapers are standard and help prevent soil sticking to the roller. This roller is ideal for widely varied ground conditions. Especially for use with trailed implements where the load-bearing capacity of other rollers is near the limit. A diameter of 585 mm and the special profiling allows the soil to be compacted in rows. Coated scrapers (standard) prevent soil sticking to the roller. 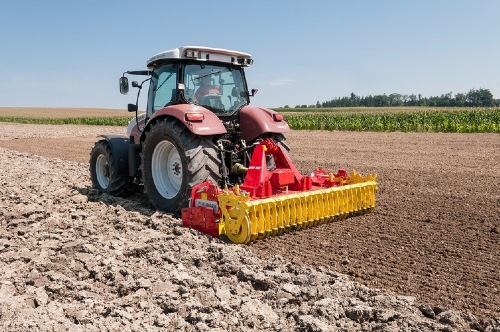 With the LION 103 series, PÖTTINGER offers models for tractors up to 200 hp. The LION 103 comes with working widths of 9.84" / 3 m, 11.48" / 3.5 m and 13.12" / 4 m.
Proven changeable speed gearbox, variable rotor speed. PTO input shaft mounted far back, low stress on the PTO shaft. Rear PTO shaft available (optional). These power harrows guarantee best results on heavy clay soils. It is the ideal choice for potato and vegetable farms. A very fine disengaged when folding the side boards upwards. is achieved because more tines are in use than on 10-rotor machines. Thanks to the interchangeable gears the rotor speed can be adjusted to suit any soil conditions and PTO shaft rpm. The LION 303.12 / 353.14 universal 0.59 x 11.91" / 15 x 330 mm tines are designed for a working depth down to 260 mm. The fully hardened tines ensure a long service life.